Real San Francisco. Real history. Real fun. As we move ever closer to the end of 2018 the holiday highlights begin to shine. Construction on the holiday ice skating rinks at Union Square and the Embarcadero Center have begun. Union Square began staging Holiday decoration sales before Halloween and now they unpack their bangles and bows to create winter wonderlands for Black Friday. Chefs and family cooks begin reviewing favorite recipes and FOOT! dusts off our winter indoor tours with Hobnobbing With Gobs of Snobs! 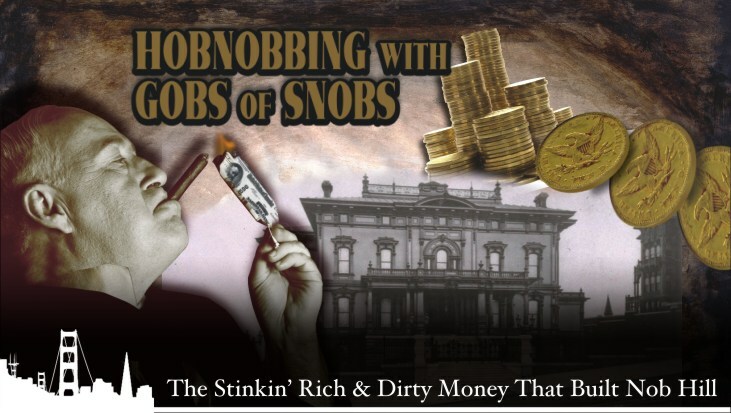 Learn about the filthy rich who once Hob Nobbed on Nob Hill and the dirty tricks that created their vast wealth. The only thing we are taking from the rich is their stories and their lauded excesses to share in a more equitable fashion. And as Always our Tour of The Month include the usual trademark fun and frivolity from FOOT! fun walking tours. Tickets for our Tour of the Month will be discounted all month long. And, since November is the perfect month to be thankful, proceeds from it will go to the San Francisco-Marin Food Bank, a local non-profit whose mission is simple: to end hunger in San Francisco and Marin. To learn more about the SF-Marin Food Bank, or to donate directly to them, click here. Learn about getting discounted tickets for our Tour of the Month here. For our loyal newsletter readers, we also have two-for-one discounts on selected ongoing tours. Check out our Facebook page under the ABOUT tab and look for DISCOUNTED TICKETS. Also, please like us. (We like you.) Or to get last-minute tour discounts and even specialer specials, follow our tweets: @FOOTtours. Explore the beauty of The City through lights, decorations, gingerbread, and a dozen only-in-San Francisco traditions on our Luscious Lobbies tour. This seasonal favorite fill sup fast, so book now. For more information about our seasonal walking tour, click here.